Animal shelters face significant challenges in preventing, diagnosing, and treating many forms of infectious disease due to limited financial and organizational resources. Daily decisions must be made about the best allocation of resources for prevention and treatment of disease, spaying/neutering, and behavioral rehabilitation. HWD is among the most complex infectious diseases to detect, treat, and prevent. For that reason, it presents a special challenge to animal shelters. According to a 2009 compliance study2 published by the American Animal Hospital Association (AAHA), 64% of dogs do not receive any heartworm preventive medication. Considering how difficult achieving compliance with veterinary recommendations is among the best clients, it is easy to understand how a surrendered animal is unlikely to have received good or consistent preventive veterinary care. More effectively counsel clients who have adopted their pets from animal shelters. HWD is particularly hard for shelters to manage due to the cost, time, and other resources associated with diagnosis and treatment. Many animal shelters strive to help as many animals as possible by keeping the average length of stay to the shortest possible duration. The added time required to kennel a dog and treat it for HWD means that place in the shelter is unavailable for another dog. Furthermore, some animal shelters do not have trained staff available to perform heartworm testing or provide treatment. Veterinarians must understand how their local shelters operate. Rather than passing judgment on the chosen testing or prevention policy, understanding the reasons behind the shelter’s choices can help veterinarians be good partners with people who adopt from the shelter. Today’s adopter is tomorrow’s client. Some shelters are receptive to private practitioner input and suggestions for improvements to protocols, while others want to stay focused on the priorities they have already chosen. An estimated 30% of pets in the U.S. are acquired from animal shelters, and that number is growing.3 Veterinarians in private practice frequently find themselves counseling clients who have adopted, or are considering adopting, a pet from an animal shelter. When a recently adopted animal is presented to the clinic, it is important to understand the substantial variation in how shelters are able to manage prevention, diagnosis, and treatment of HWD. Make heartworm-positive dogs available for adoption, with the caveat that it is the adopter’s responsibility to pursue testing and treatment. It is also important to know whether local shelters bring in animals from areas of the country that have a higher prevalence of HWD. Transportation of heartworm-positive dogs over long distances, especially from the Mississippi Delta region, poses increased risk because dogs may harbor heartworms that have decreased susceptibility to heartworm preventive agents. These dogs need to have the adult worms and microfilariae eliminated by appropriate treatment, as described in the AHS guidelines.4 To do anything less may risk the transportation of resistant worms to other areas of the country. Although funds may not be available for HWD diagnostics in all shelters, an ideal goal is to perform a heartworm antigen and microfilaria test in all dogs at intake, as recommended by the American Heartworm Society (AHS) in their current guidelines.4 Shelters that do not test their dogs for heartworms should communicate to adopters that immediate, and annual, testing is critical in order to detect infection and initiate treatment, if needed. Heartworm infection in cats is a more elusive diagnosis, requiring use of heartworm serology, thoracic radiography, and echocardiography for clinical diagnosis. None of the presently available antigen tests can be relied upon to rule out feline HWD, and the correct interpretation of antibody test results requires additional information and thoughtful analysis. Because cats do not pose a risk for heartworm transmission, testing for heartworms in the shelter cat should be reserved for symptomatic cats. Shelters often spay or neuter heartworm-positive dogs without a full diagnostic workup and before treatment for HWD. This may be due to the need to treat conditions on an empirical basis, saving blood work and radiography for animals with obvious clinical signs. However, heartworm-positive dogs are more stable from a cardiovascular standpoint immediately before treatment than they are in the first few weeks afterward. Thus, spaying or neutering asymptomatic dogs before the melarsomine phase of heartworm treatment is recommended. The AHS protocol is considered the gold standard for elimination of heartworms from dogs, based on current knowledge. This protocol for dogs entails a pretreatment phase that includes administration of doxycycline and monthly heartworm preventive agents for 2 months, before beginning a 3-injection treatment with an adulticide. Some shelters can implement this protocol while dogs are under their care or in foster homes, while others must leave treatment to adopting owners and their veterinarians to implement. Not all shelters share the same level of expertise in heartworm treatment or client education. In the shelter setting, the decision to use a treatment protocol other than the AHS protocol can be a deliberate “war zone” approach to treating HWD—in human medicine, treatment options in war zones or developing countries do not always reflect the best recommendation available, but are better than no option. Melarsomine/Doxycycline/Macrocyclic Lactone/Prednisone. For instance, a treatment protocol in which 2 melarsomine injections are administered as described in the product insert decreases total adult worm numbers by 90% and male worm numbers by almost 100%. Administering doxycycline and a macrocyclic lactone during the 1-month rest period after melarsomine administration eliminates most of the remaining circulating microfilariae, and any remaining adult worms are essentially sterile and die of attrition over time. Furthermore, any remaining microfilariae are unlikely to develop into adult worms even if ingested by a mosquito and eventually transmitted to another canid. Finally, administration of prednisone after the melarsomine injections, as described in the AHS protocol, may decrease the complication rate. This protocol is not the best approach, but reduces the time and cost of treatment, and it is an improvement over the 80% worm burden reduction seen in the days of caparsolate therapy. Another suboptimal therapeutic choice is administration of a monthly preventive, along with doxycycline pulse therapy. “Slow Kill” Protocol. Shelter staff members that implement the “slow kill” protocol, or recommend it to adopters, are usually well intentioned—doing their best to start the pet off on the right foot based on the knowledge and resources they have. The myth that the “slow kill” method is “just as good” as melarsomine therapy may have originated in McCall and colleagues’ 2001 study.5 This study demonstrated that 30 months of ivermectin at preventive doses reduced 7-month-old worms by 94% and 8-month-old worms by 56%. However, the older the worms are at the start of “slow kill” therapy, the less efficacious the therapy is in the patient. Unfortunately, adopters are frequently instructed that the worms will “just go away” if monthly heartworm preventive medication is administered. In addition, concomitant doxycycline therapy to eliminate Wolbachia species and potentially reduce inflammatory damage may not be recommended. However, shelter staff should inform adopters when dogs are being treated with a protocol that is less than the gold standard, and instruct them to consider following up with their veterinarians for further treatment. This is a rational approach given the limited time and resources in the shelter setting. In January 2014, the AHS and Association of Shelter Veterinarians (ASV) formed a working group to better understand current practices of animal shelters concerning HWD. A survey of the ASV membership was undertaken in February 2014. A total of 105 shelter veterinarians from North America* completed the survey. Most participating veterinarians worked for a municipal animal control facility or private humane society/Society for the Prevention of Cruelty to Animals. While shelters range significantly in size, most veterinarians worked in shelters that admit 1000 to 5000 dogs and 1000 to 5000 cats annually. Participants in this survey were generally well versed in best practices in shelter medicine. Prevalence of canine HWD varies significantly. Sixty-three percent of veterinarians who answered the question “What percentage of the dogs admitted to your shelter last year was heartworm-positive?” stated that 5% or fewer of dogs admitted to their shelters were heartworm positive, 21% reported incidence of 5% to 10%, 9% reported a prevalence of 11% to 25%, and 7% reported that more than 25% of dogs admitted had HWD. The prevalence of HWD in shelter cats is much less well known. Ninety-four percent of shelter veterinarians responded “I don’t know” to a question about heartworm incidence in cats. Shelters advocate heartworm prevention and testing in dogs. Sixty-seven percent of ASV respondents said that monthly heartworm prevention is administered to dogs. The number is lower in cats, with 1 in 5 veterinarians reporting that monthly preventive agents are administered. Testing trends follow suit: 42% of shelters tested all dogs for heartworms and 48% tested “some dogs.” By contrast, 94% of shelters did not test cats for heartworms; of those that did, testing was limited to symptomatic cats. Treatment is a priority for heartworm-positive dogs. Thirty-five percent of ASV veterinarians reported that “all positive dogs are treated,” while another 50% said that “some dogs are treated.” Treatment, however, may or may not have taken place at the shelter. Of shelters that treat heartworm-positive dogs, most follow protocols involving a 2- or 3-dose administration of melarsomine. Only 7% reported using “monthly ivermectin administration alone” as an adulticide, while 12% reported using another protocol. In addition, 80% reported using doxycycline in their treatment protocols. * Reporting members represented the following regions of North America: Northeast (15%), Southeast (32%), Midwest (12%), West (20%), and Canada (2%); 14% did not report their geographic location when responding to the survey. 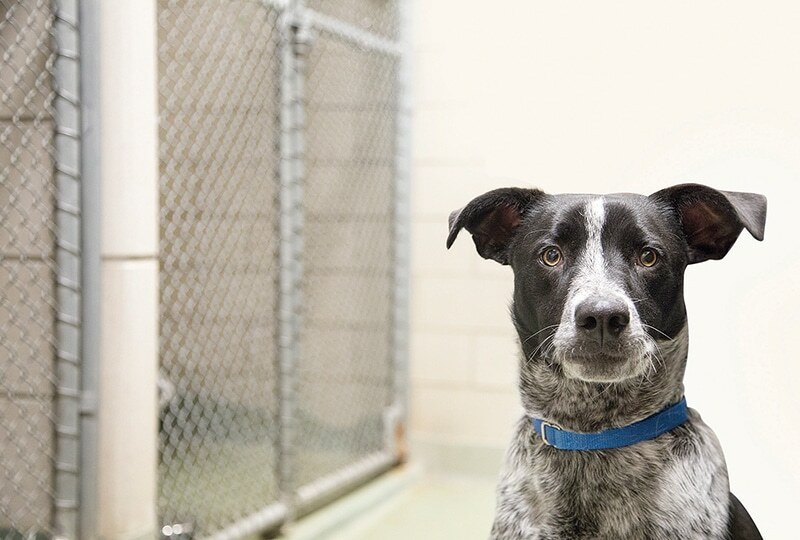 It is important to educate clients considering adopting an animal from a shelter about the possibility of heartworm infection, given the shelter’s practices and local heartworm prevalence. Due to the lag time between exposure to HWD and the point at which a pet tests positive, clients should be counseled that an animal is not considered truly heartworm-free until 2 antigen tests—separated by 6 months—detect no signs of infection. Most shelter animals have no known veterinary history before admission to the shelter, so recently adopted animals need to return to the veterinarian for a repeat heartworm test 6 months after their initial visits. Because young worms and low worm burdens do not generate enough antigen to result in a positive test result, the AHS recommends the use of the more accurate “no antigen detected” language, rather than a reporting of a “negative” result. “Slow kill” treatment is less effective than the adulticide treatment recommended by the AHS and may not eliminate all the worms—even after 18 months or more of treatment. The AHS has a useful app (heartwormtoolkit.com) that helps plan treatment protocols. For more information on canine HWD treatment, including a table outlining the AHS protocol for treatment, read Principles of Treatment: Canine Heartworm Disease, published in the March/April 2015 issue of Today’s Veterinary Practice and available at tvpjournal.com. Animal shelters play a vital role in communities by reducing the problems caused by stray and unwanted animals, and they play an important part in facilitating pet acquisition. When people adopt, they are serving a role in animal rescue and reducing the number of animals euthanized in animal shelters. It is vital to remember that heartworm positivity among pets in shelters is not the fault of the shelter or animal. The animals are caught in social and economic circumstances that may have kept them from receiving proper preventive care, and animal shelters are instrumental in helping stray or unwanted animals become healthy and cherished pets. Veterinarians can help clients bring their new, adopted pets along the pathway to health and happiness through understanding; communication; and good heartworm testing, treatment, and prevention practices. Colby KN, Levy JK, Dunn KF, Michaud RI. Diagnostic, treatment, and prevention protocols for canine heartworm infection in animal sheltering agencies. Vet Parasitol 2011; 176(4):333-341. American Animal Hospital Association. Compliance: Taking Quality Care to the Next Level, 2009; available at aaha.org/professional/store/product_detail.aspx?code=cmtkq&title=compliance_taking_quality_care_to_the_next_level#gsc.tab=0. GfK Roper Public Affairs & Corporate Communications. The AP-Petside.com Poll, 2011, available at ap-gfkpoll.com/main/wp-content/uploads/2011/11/AP-Petside-com-October-2011-Pets-Topline-FINAL_Shelter.pdf. Nelson CT, McCall JW, Carithers D (eds). Current Canine Guidelines for the Prevention, Diagnosis, and Management of Heartworm (dirofilaria immitis) Infection in Dogs, 2014. Available at heartwormsociety.org/images/pdf/2014-AHS-Canine-Guidelines.pdf. McCall JW, Guerrero J, Roberts RE, et al. Further evidence of clinical prophylactic, retroactive (reach back) and adulticidal activity of monthly administrations of ivermectin (Heartgard PlusTM) in dogs experimentally infected with heartworms. In Seward RL (ed): Recent Advances in Heartworm Disease: Symposium 2001. Batavia, IL: American Heartworm Society, 2001, pp 189-200. McCall JW, Ryan WG, Roberts RE, Dzimianski MT. Heartworm adulticidal activity of prophylactic doses of ivermectin (6 μg/kg) plus pyrantel administered monthly to dogs. In Seward RL (ed): Recent Advances in Heartworm Disease: Symposium ‘98. Batavia, IL: American Heartworm Society, 1998, pp 209-215. Martha Smith-Blackmore, DVM, is a Fellow of the Center for Animals and Public Policy at Tufts Cummings School of Veterinary Medicine. She is also the current chair of the AVMA Animal Welfare Committee and a board member of the AHS. Dr. Smith-Blackmore was present at the forming of the ASV, and went on to become the president of that organization, co-authoring the ASV’s Guidelines for Standards of Care in Animal Shelters. She received her DVM from Tufts Cummings School of Veterinary Medicine and completed an internship at the MSPCA’s Angell Animal Medical Center.